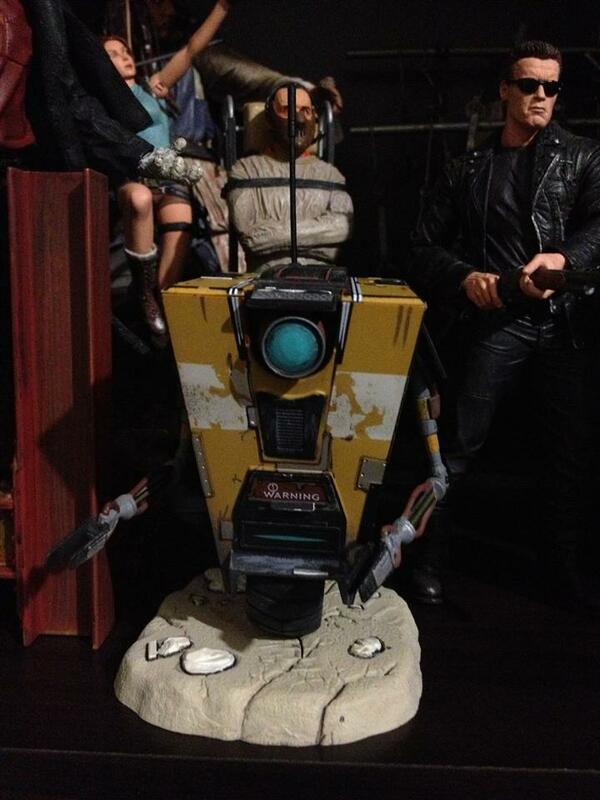 NECA Borderlands Claptrap collected in Figure Collection by Tayler Rowe - Collected It! Back again guys with another figure review and this time its with one of my favorite video game characters of all time, Claptrap! The witty yet ill-informed maintenance droid from the award winning Borderlands series pelvic thrusts right off your shelf in this beautiful figure from NECA. The game's bold black lines and bright colors are transformed to life amazingly in this figure. I found this little guy at my local game shop for a steal at $30 and was very satisfied upon opening him, although I must report that anyone who is considering getting one of them must be extremely careful when putting him in position. The skinny arms are very frail and easily broken, the antenna is extremely flimsy so TAKE CARE. In conclusion, you must get this figure if you wanna change up the style of your collection because it adds a lot of difference when standing next to "people style" figures. 9/10.